“Police Obstruction” Case Against Jason is Dropped! 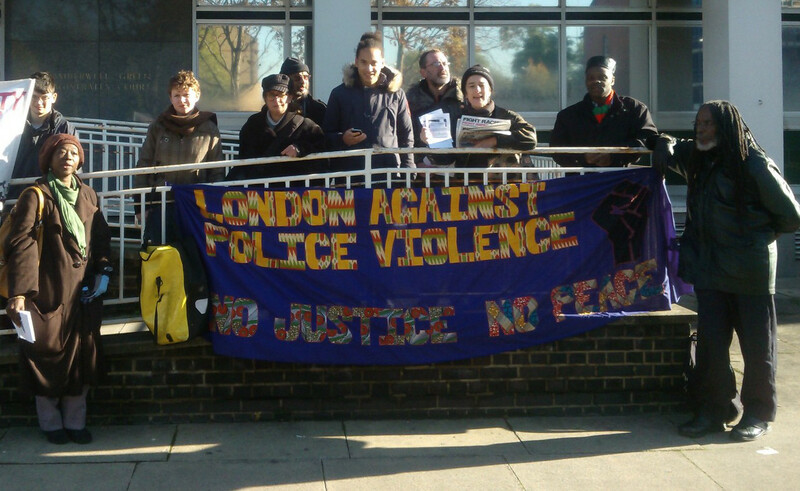 The London Campaign Against Police & State Violence (LCAPSV) celebrates with Jason as the spurious case against him of “obstructing the police” was dropped after just half a day in court. The case against him was heard at Camberwell Green Magistrate’s Court, where Jason’s supporters and members of LCAPSV maintained a presence both inside and outside the court throughout the proceedings. After hearing the testimonies of the two police officers who began the assault on Jason on 9 June, the judge concluded that the evidence given was “conflicting and lacking in coherence”, and that clearly there had been no reasonable grounds for the search in the first place. The officers were unable to provide any evidence that there was anything specific to Jason or his behaviour that could have justified him being targeted for a drugs search – obviously the mere fact of being a black man in a phone box in Camberwell was enough to criminalise him in the eyes of these officers. Although the case against Jason has been dismissed, the police have yet to answer for their violent assault against him. One of the officers has already admitted in court today to punching Jason in the head, deploying CS spray, and said he would have used his taser if he’d been able to reach it – and completely failed to give any credible justification for this level of force. Jason will be pursuing a civil claim against the police, and thanks everyone who has supported him so far. LCAPSV continues to stand with him, and to oppose police brutality and other forms of state violence.